Lucy wants to explore the great outdoors, but at a blazing 103 degrees this afternoon, a fur coat might not be a good thing! Besides, Lucy is strictly an indoor kitty, although she does enjoy the views! 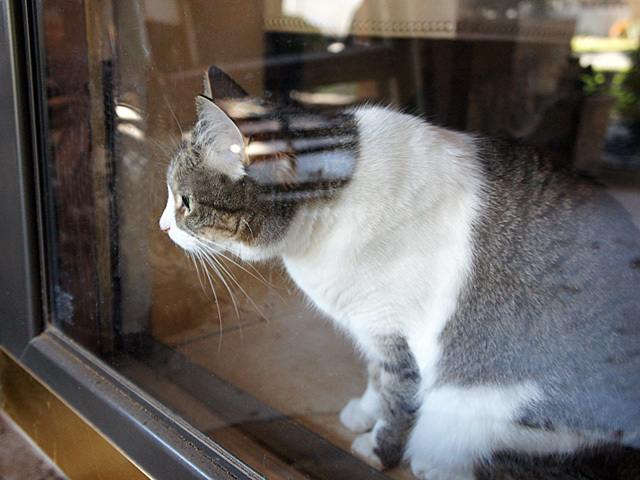 This entry was posted in Pets, Wordless Wednesday and tagged cat, Fur Coat, kitty, Outdoors, Outside, pet, Storm Door, Summer, Wordless Wednesday. Bookmark the permalink. Our kitty has to settle for a great view too! Nice picture. Thanks! Yes fortunately we do have quite a few nice big windows that have sills about 10″ from the floor, and they help a lot! Then of course there are all the birds and squirrels. Cute picture! Our kitties like looking at the view occasionally too but they find plenty to get into indoors! Yes my guys stay busy indoors as well. And of course they have each other and my dog Gracie, so they keep each other company when I’m not home! That’s so cute! We don’t get to go out unless it’s in our stroller or out for a quick bit on our patio. Oh my kitties would SO love to go outside. I always feel so sad because they literally come running and crowd the door whenever the weather is nice enough here to just use the screen doors. Ahhh…the smell of fresh air is quite enticing! But hey I sleep better knowing that they are inside and safe. Maybe someday I can have a screened-in porch (dream). Trust me Lucy – it’s MUCH better in the AC! If you went out, you’d probably be meowing to get back in! Hey Ann – you got that right!!! Good idea, I’ll keep her in where it’s cool and just keep her playing and happy! You sure look pretty looking out sweet Lucy! Awwwww….thanks for the kind words, coming from such a handsome fella! You so don’t want to be out there buddy! We’re struggling with 100+ temps here too, I’m vegging out on the tiles to try and keep cool as our a/c is broken and the man can’t come to fix it yet – doh! Think Mum’s gonna join me on the tiles soon?